October 24, 2016 - "Press Releases"
Compac Development Corporation, established 1976, is the only manufacturer that specializes in meeting your RFI/EMI shielded enclosure requirements. Compac offers an extremely versatile line of off-the-shelf shielded enclosures plus the additional capability of customizing our standard product lines, manufacturing to your specs, from prototype to production. To further support the design function Compac offers a broad selection of RF accessories, gaskets, coaxial attenuators, coaxial terminations, filter feed-thrus, connectors, mounting bars, etc. The Compac concept is geared to fast, accurate, dependable deliveries that meet the most demanding delivery schedules. Compac's unique product line can easily be tailored to meet your many specifications. But if our RFT, Blank or SRF Series do not fit your basic requirements, Compac can build a totally custom enclosure quickly and inexpensively. Compac's versatility converts your design into a finished product ready for assembly and installation. All you have to do is supply the circuitry! 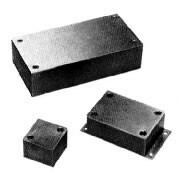 Compac Development Corporation, established 1976, specializes in meeting your RFI/EMI shielded enclosure requirements.